The overall aim of the interdisciplinary research project “PharmCycle” is to reduce the contamination of the aquatic environment with antibiotics by developing sustainable antibiotics, improving the environmental risk assessment of antibiotics, and reducing the discharges of antibiotics in the wastewater outlet. An overview of the holistic approach and first results are given. The first step is to design sustainable antibiotics, which are effective against target organisms but, after their use, are less toxic, and are rapidly and completely degradable. To develop sustainable antibiotics, two different approaches (subprojects) are applied within PharmCycle: First, a re-design of the existing antibiotics with chemical and in silico methods (“Benign by Design”). Second, sustainable peptide-based antibiotics are produced with biotechnological methods. In the second step, the environmental risk assessment for antibiotics in the framework of the authorization process and for monitoring purposes is improved. There is a lack of data for the environmental risk assessment of antibiotics on the European market. With more transparency of these data, the environmental risk assessment for active substances and for the class of antibiotics can be improved. The aim is to increase the data availability by applying the Aarhus convention and by providing legal access to environmental information. Beside other shortages in the environmental risk assessment required by the European legislation, the effects of antibiotics directly applied in marine aquacultures are not assessed by marine prokaryotic test systems. Therefore, a marine cyanobacteria test was developed, which is more sensitive to selected priority antibiotics than the marine eukaryotic algae test (DIN EN ISO 10253) required by the European Medicines Agency. Marine cyanobacteria are of high importance for the nitrogen cycle and primary production. Moreover, they seem to play an important role with respect to climate change. To reduce the emission of antibiotics used as human pharmaceutical products to the aquatic environment, the third step focusses on the main pathway, the wastewater. Investigations to improve the wastewater treatment of priority antibiotics and sustainable antibiotics are conducted by a combination of methods: activated sludge units, activated carbon adsorption, and membrane filtration systems. 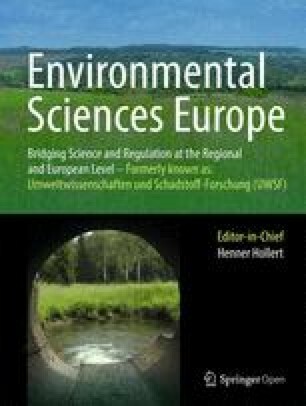 With the aim of improving the environmental risk assessment of antibiotics and to reduce the emission of antibiotics to the aquatic environment, an interdisciplinary approach is applied which includes the analysis of the German, European, and international law and the development of new legal instruments. The contamination of surface water and drinking water with pharmaceuticals is increasing globally , and the consequences for ecosystems and humans have not been assessed. The key objective of the interdisciplinary research project “PharmCycle” is to improve the environmental risk assessment of antibiotics and to reduce the emission of antibiotics to the aquatic environment and drinking water supply. Because of the high consumption of antibiotics as human and veterinary pharmaceuticals, their occurrence in aquatic ecosystems [5, 7] and the problem of antibiotic resistance [31, 37], the project focusses on these classes of pharmaceuticals. Sustainable pharmacy: A sustainable design and production of antibiotics based on chemical and in silico methods (Kümmerer). Sustainable peptide-based antibiotics developed with biotechnological methods (Andrä and Cornelissen). Improvement of the environmental risk assessment of antibiotics in the framework of the European authorization of pharmaceuticals (Heseding and Floeter). New wastewater treatment processes are investigated with regard to their potential to reduce the emission of antibiotics (Einfeldt and Beyer). International, European, and German environmental law are analyzed, and legal instruments to enhance the water quality with regard to pharmaceuticals are developed (Oelkers and Floeter). For the studies on the environmental risk assessment and wastewater treatment commercially available antibiotics were prioritized with regard to different criteria, e.g., consumption rate in Germany, concentration measured in the aquatic environment, degradation rate, different modes of action, and availability of wastewater treatment data. These two subprojects thereby focus on the following priority antibiotics: Sulfamethoxazole, Trimethoprim, Ciprofloxacin, Clarithromycin, Erythromycin, and Doxycycline. The environmental risk assessment also investigates the effects of Florfenicol used in aquaculture. For the development and validation of optimized environmental risk assessment and wastewater treatment, the results of the environmental risk assessment and improved wastewater treatment for selected priority antibiotics are compared to the results of the sustainable antibiotics developed within PharmCycle. Sustainable pharmacy considers the complete life cycle of pharmaceuticals—from the design, processing, use, and disposal to the occurrence in the environment. It is of high importance to develop active substances, which adequately fulfil their purpose, and, after their use, are less toxic and will be quickly and completely degraded during wastewater treatment or in the environment. The targeted design of chemicals and pharmaceuticals for biodegradability in the environment (“Benign by Design”) addresses this point [20, 21, 25]. For the new design of compounds, extensive research was undertaken [25, 35]. The starting point for the new design is the molecular structure of an environmentally non-biodegradable antibiotic which is modified systematically. Promising candidates were then selected using experimental and in silico methods addressing desired pharmaceutical and environmental properties and, subsequently, synthesized and experimentally evaluated for their effectiveness as antibiotics, ecotoxicity, and biodegradability. This subproject addresses the problem at the source, in terms of design and biotechnological production of antibacterial active and biodegradable compounds. These novel antibiotics are based upon natural structures, the so-called antimicrobial peptides [15, 41]. Antimicrobial peptides (peptide antibiotics), such as all natural proteins and peptides, are easily degradable. It can be assumed that application of peptide-based antibiotics will reduce contamination of surface waters. In contrast to established antibiotics, antimicrobial peptides act primarily by physical destruction of the barrier function of the bacterial membrane (Fig. 1) . This mode of action circumvents the existing resistance mechanisms against antibiotics, e.g., antibiotic degrading enzymes (β-lactamase) or modifications of antibiotic targets (MRSA resistance to penicillin). In addition, it is extremely fast, and thus, the emergence of resistances against this type of drugs is protracted . Within this project, the established expression systems Pichia pastoris and Escherichia coli were chosen for the biotechnological production of peptides [32, 39]. 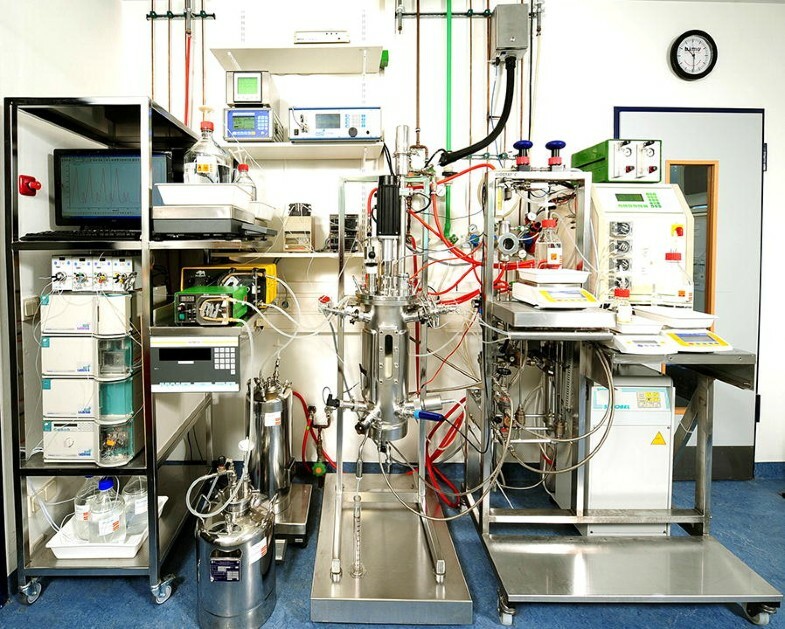 Cells were cultivated in a highly instrumented bioreactor (Fig. 2). 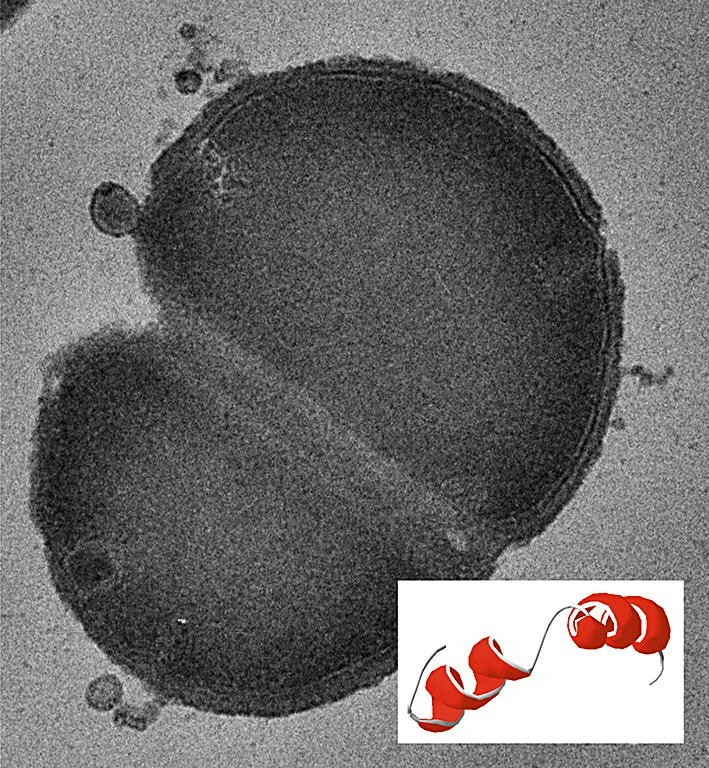 The product is secreted by the cells into the culture medium or accumulates intracellularly. After cell separation by centrifugation and, if necessary, cell disruption, peptide antibiotics were purified by chromatography. The aim of this subproject is to improve the environmental risk assessment of antibiotics in the framework of the European authorization process and for monitoring purposes. The environmental risk assessment for human pharmaceuticals (HMP) is mandatory since 2006  and for veterinary pharmaceuticals (VMP) since 1998 [12, 19]. The environmental risk assessment of HMP and VMP is product-based, so that there is no comprehensive monograph system for active substances. Beside the lack of data on the environmental risk assessment for antibiotics placed on the market before this time, the data availability for the antibiotics after the implementation of the European guidelines needs to be improved and will be developed with legal instruments (see “Environmental law” section). In addition, from an ecological point of view, there are several shortcomings in the framework of the European environmental risk assessment. In the environmental risk assessment, the effects of HMP and VMP on the growth of freshwater cyanobacteria, effects of HMP on activated sludge , and effects of VMP on nitrification  are investigated. Further aspects, such as the effects of antibiotics, used in marine aquaculture, to primary production of the N2 fixing marine cyanobacteria, effects on microbiomes and symbiotic interaction are not considered. Moreover, the knowledge of antibiotic resistance in the environment and its consequences is limited  and should be improved. Within this subproject, one aim is to improve the environmental risk assessment of antibiotics applied in aquaculture. Worldwide, the amount of marine aquaculture is increasing . Aquacultures are often operated in open coastal systems (cages) with widespread use of antibiotics directly entering water bodies and adjacent sedimentary areas . Investigations showed that industrial mariculture systems were important antibiotic resistance genes’ (ARGs) reservoirs in coastal area . The impact of antibiotics, used in aquacultures, on important prokaryotic marine primary producers, such as marine cyanobacteria, is not assessed within the authorization process. Marine N2 fixing cyanobacteria are of high importance for the nitrogen cycle . The importance of marine cyanobacteria for marine ecosystems might even increase with climate change [17, 33]. It is known that freshwater cyanobacteria can be very sensitive to antibiotics in toxicity tests e.g., [13, 38]. There is not much known about the effects of antibiotics on marine cyanobacteria, as there is no international standardized test available. Therefore, within this subproject, a new marine cyanobacteria test with marine species of the genus Anabaena spec. and Synechocystis spec. (Fig. 3) measuring the inhibition of the growth rate in 72 h was developed. The selected priority antibiotics were tested. Further studies on the effects of sustainable antibiotics, developed within PharmCycle, on marine cyanobacteria were conducted. From a global perspective, antibiotics enter the aquatic environment from the following most important emission sources: effluents from pharmaceutical production processes [23, 24, 28], the use of farm fertilizers such as manure and sewage sludge, often contaminated with antibiotics  and effluents from municipal wastewater treatment plants for household and hospital wastewater [1, 6, 7, 9, 27]. Furthermore, antibiotics directly enter the aquatic ecosystem used in aquaculture. As long as sustainable pharmacy is not implemented, there is a need to reduce the emission of pharmaceuticals at the end of the pipe. The aim of this subproject is to reduce the emission of antibiotics and its transformation products to surface water with an enhanced wastewater treatment. So far, the standard wastewater treatment plants within Europe are not able to reduce micro-pollutants like antibiotics sufficiently. Enhanced wastewater treatment plants, which are currently implemented on a large scale, especially in Switzerland and only locally in Germany, were able to reduce the pollution of the surface water, but not to solve the emission of anthropogenic micro-pollutants completely [4, 29, 30]. This is due to partly low elimination rates of the advanced wastewater treatment processes and to the possible formation of new transformation products during wastewater treatment. In an integrative approach, such as the PharmCycle project, it remains important to optimize municipal advanced wastewater treatment processes, as they can continue to function as pollutant sinks. The upgrade of treatment plants by an additional fourth treatment stage requires special care for a variety of reasons: it has to cover a wide range of substances while, at the same time, avoiding toxic degradation products or chemical interactions. Furthermore, the treatment process must be economically viable and should be integrated into the existing plants without great effort. The aim of this subproject is, therefore, to test and evaluate various processes and process combinations, using activated sludge units, activated carbon adsorption, and membrane filtration systems to eliminate commercially available antibiotics like the selected priority antibiotics (i.e. Sulfamethoxazole, Trimethoprim, and Doxycycline) and sustainable antibiotics developed within PharmCycle. The aim of this subproject is to analyze international, European, and German pharmaceutical legislation, and to develop legal instruments that contribute to the improvement of environmental risk assessment of pharmaceuticals and to reduce the emissions of pharmaceuticals into aquatic ecosystems and drinking water. In particular, the European pharmaceutical approval law (Art. 8 of Directive 2001/83/EC and Art. 12 of Directive 2001/82/EC, as well as the relevant EMA guidelines) is examined with regard to the data and information on the environmental risk assessment. The purpose of this article is to give an overview of the holistic approach and present first results. Detailed publications on each subproject are in preparation separately. The environmentally biodegradable antibiotics developed using the two different approaches (“benign by design” and peptide-based antibiotics) have been investigated with regard to their properties, such as activity, ecotoxicity, and behavior in the wastewater treatment process, and were compared to the characteristics of the priority antibiotics selected in PharmCycle. With the “Benign by Design” approach, a combination of in silico and experimental methods was successfully applied. The new compounds are active, give satisfactory results with regards to their ADMET properties (adsorption, distribution, metabolism, and toxicity) as needed, and have been shown to be biodegradable and inactivated in the aquatic environment. Two patents have been filed. That demonstrates, on one hand, that it is feasible to meet environmental biodegradability and mineralization and pharmaceutical activity and sufficient stability in the human body and ADMET properties, which are indispensable for pharmaceutical candidate molecules. On the other hand, it also demonstrates that the design of pharmaceuticals for environmental biodegradability results in intellectual property, which, in turn, is the basis of new business opportunities. This research also demonstrates that if such an approach (environmentally benign by design, principle no. 10 of green chemistry, ) is feasible for pharmaceuticals, it should also be applicable for all chemicals that may enter the water cycle as the hurdle for chemicals is much lower, because there is no specific biological activity needed. This example is, therefore, an important contribution of chemistry and pharmacy to meet Sustainable Development goal #6 of the United Nations and to sustainable chemistry , in general. A new marine cyanobacteria test with Anabaena spec. and Synechocystis spec. was successfully developed. Comprehensive studies showed that both species are significantly more sensitive to the selected priority antibiotics than the marine algae with the eukaryotic Bacillariophyceae Phaeodactylum tricornutum according to the test procedure DIN EN ISO 10253 (2016). Thus, the marine cyanobacteria test is recommended for standardization and implementation in the EMA guideline for the environmental risk assessment for antibiotics used in aquaculture. Studies with consecutive and long-term exposure of the selected priority antibiotics to these marine cyanobacteria do not indicate antibiotic resistance so far, but indicated an increase in the sensitivity for some of the priority antibiotics to marine cyanobacteria. According to climate models, climate change may increase the occurrence of marine cyanobacteria in the Baltic Sea . Moreover, marine cyanobacteria may have an effect on climate change on a global scale . Thus, long-term studies on the effects of antibiotics to marine cyanobacteria are of importance to the understanding of their impact, which cannot be achieved by extrapolation from freshwater cyanobacteria data. The laboratory scale activated sludge units, activated carbon adsorption unit, and membrane filtration systems have been put into operation and tested. First, examinations of the biodegradability of Sulfamethoxazole as well as the adsorption capacity of activated carbon for Sulfamethoxazole, and Trimethoprim showed the need for further optimization. An analysis of environmental law has shown that current pharmaceutical legislation, with its pre- and post-control instruments, does not adequately control environmental risk and results in incomplete, product-based data collection . For example, for human medicines authorized before 2006, there are no data on environmental risk assessment at all . Moreover, the existing data on active substances are neither sufficiently employed nor even consistent . For example, different and sometimes even contradictory environmental risk assessments exist for an active substance . It has also been shown that different manufacturers of the same active substance have difficulty sharing results of environmental risk assessments without a clear legal framework for the classification of commercial secrets, which could enhance the existing assessments and ensure their consistency . Reasons for their insufficient use as well as for the lack of publication of the collected information are the usual conflicting commercial secrets. However, the European Medicines Agency generally classifies information about environmental risk assessments as non-confidential . Another deficit is the public accessibility of the existing data. Even when data are publicly available, the information is difficult to find , because there are different databases, depending on the type of approval process, which are product-based and primarily geared towards information about effects on human health. Based on an analysis of statutory databases, a complete picture of publicly available environmental information on the antibiotics studied in this project will be constructed. This data availability will be compared to the requirements of environmental information law (in particular of the Aarhus Convention). The aim is to improve the availability of environmental risk assessments through environmental information law, thus providing the basis for an active substance-based database that sufficiently reflects the current knowledge of environmental risk assessment data, and provides both transparency and use by the public, authorities, and manufacturers. With this database, environmental risk assessments for active pharmaceutical substances can be conducted and further risk mitigation measurements developed and implemented. The contamination of antibiotics in aquatic ecosystems and drinking water is of high environmental and human health concern. With the interdisciplinary project, PharmCycle introduced here a promising holistic approach is presented: Sustainable design can be used as approaches to enhance environmental risk assessment and to reduce emissions via wastewater, to protect the aquatic ecosystem. JA and GC: “Sustainable peptide-based antibiotics”. JE and FB: “New wastewater treatment processes”. CF: “Abstract“, “Background”, “Methods”, “Results and discussion”, “Conclusions”. JH and CF: “Improved environmental risk assessment for antibiotics in the framework of the European authorization”. KK: “Sustainable pharmacy”. KO and CF: Environmental law. All authors read and approved the final manuscript. The authors would like to thank the Applied University of Hamburg and the law office Teppe Hamburg and the Deutsche Bundesstiftung Umwelt (K. Kümmerer) for their funding. This article gives an overview over the project structure and first outcomes. Further data will be published as soon as possible. The PharmCycle project is funded by the Applied University of Hamburg (Fond for the Future). The legal subproject is supported by the law office Teppe Hamburg. Most of the work on the environmentally biodegradable antibiotics with the “Benign by Design” approach was funded by the Deutsche Bundesstiftung Umwelt.